A controversial late Southampton goal robbed Burnley of their first win since December. Manolo Gabbiadini cancelled out an Ashley Barnes header in an increasingly lively 1-1 draw at Turf Moor. The first half was one for the purists, though. Neither side truly tested the opposition’s goalkeeper, and while the hosts had the better of the ball, they were unable to carve open a usually shaky Southampton defence. Johann Berg Gudmundsson had the game’s first opportunity after a whipped cross from Stephen Ward made its way to the Iceland international, but he could only head wide from 10 yards out. It was Ward’s first appearance since Burnley beat Stoke, an absent stretch that coincided with a 10-game winless run for the Clarets. His defensive colleague Ben Mee was called into action not long after as Burnley lost the ball in midfield, allowing Nathan Redmond and Dusan Tadic to link up and provide the first half’s best chance. Tadic’s left footed shot was cleared from just in front of Nick Pope by Mee, with the ball looking like it was set to creep into the bottom left hand corner. For the next ten minutes or so Saints looked the most likely as they exploited both flanks with Redmond in particular looking a danger to the hosts backline. Tadic fed the Englishman who found himself in a central position with time and space on the edge of the box, but he could only fire the ball low into Pope’s grasp. Urged on by a crowd containing England manager Gareth Southgate, Burnley began to grow into the game and Aaron Lennon had the hosts’ best opportunity of the half. Lennon, who earlier had a low volley saved by Alex McCarthy, again forced a save from the visiting goalkeeper, this time a Matt Lowton cross found Barnes who teed up the ex-Everton winger but his shot was blocked on the edge of the six-yard box. Into the second half and it was again Redmond who looked most likely to break the stalemate. A tricky run evaded the tackle of Lowton but the winger’s pull back was well cut out by Kevin Long. In the minutes after, both sides traded set pieces with Gudmundsson floating two dangerous corners into the box but the game needed a spark and it looked to get it when the former Charlton man almost found Hendrick with a clever through ball - but it was just out of the reach of the Irish midfielder. Then, just moments later another Clarets corner wasn’t properly cleared and Barnes saw his header fall wide of the keeper’s left hand post following a pinpoint Ashley Westwood cross. Southampton’s record signing Guido Carillo was coming deeper and deeper for the ball and had to feed off scraps during a spell which saw Saints struggle to move out of their own half. The visitors defence eventually gave way. A goal fitting for the low quality affair on show as Lennon’s back post cross was flicked back across goal by Gudmundsson. Hendrick scuffed his header goal-bound leaving Barnes to throw himself at the ball from two yards out, leaving McCarthy helpless. A game which by now was all Burnley had its first sight of controversy just a minute later as the home fans appealed for handball against the Saints shot-stopper. McCarthy appeared to handle the ball outside of his box in an attempt to prevent Lennon latching on to a ball forward. Within a flash the game had come to life and down the other end Pope laid his claim for a seat on England’s plane to Russia in summer by impressively clawing substitute Josh Sims’ shot onto the outside of the post after Southampton had looked to counter. Again the visitors pressed for an equaliser and under-fire boss Mauricio Pellegrino saw two headers harmlessly float into the impressive Pope’s hands. 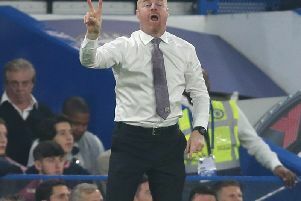 Despite Burnley’s current run, the hosts started the game in eight position following Leicester’s point at home to Stoke in the early kick-off and it was clear to see how the Clarets had successfully picked up points against the likes Tottenham, both Manchester clubs, Chelsea and Liverpool. Their patience and organisation looked set to be rewarded until a huge talking point incensed the home support. In the final minute of the 90, referee Bobby Madley looked to have impeded Westwood who was chasing a loose ball in midfield, allowing Saints to push forward. Sims floated the ball to the back post for Carillo and his header across goal found the left foot of third Saints substitute Gabbiadini. A Man of the Match performance from Mee and some fine saves from Pope were not to be rewarded with three points. There was still time for a late penalty appeal for the Clarets as Long, who along with Mee was solid for the hosts, was felled in the box but Madley waved away appeals.